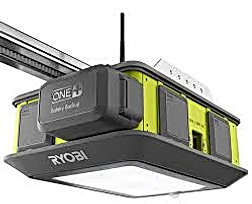 With Garage Door Opener Sales and Installation being one of the top activities here at Reliant Overhead, we frequently get asked for our recommendations on different brands of garage door openers. This article illustrates our opinions of the latest market-leading brands and models of garage door openers based on our experience with sales, installation, service, and repair of most brands in the industry. The criteria used in this review for rating garage door openers are Product Design & Reliability, Features, and Cost. **Note that Sears Craftsman and Linear Opener Models are actually manufactured by Chamberlain/Liftmaster and are essentially comparable. Most garage door opener manufacturers have similar fundamental design approaches. The actual lifting mechanisms are Chain Drive, Belt Drive, Screw Drive, and Torsion Drive. Chain Drive openers are most common and provide for long-lasting smooth reliable lifting. They do require periodic tightening and lubrication with grease. Without proper maintenance a chain drive becomes noisy and can potentially grind through the sprocket mechanism. Also, be wary of openers that have ½ chain and ½ steel cable, while this is a cheap option, it is not suited for reliability and performance. Screw Drive openers are becoming less-popular nowadays due to maintenance requirements and the fact that they are the noisiest type opener. Without constant application of lithium grease a screw-drive opener can easily eat through the trolley guide causing the opener to be inoperable. One benefit with a screw drive is that it has no slack when lifting (like a chain or belt stretching) which can help with heavy doors or restrictive flow scenarios. Belt Drive openers are quickly becoming the choice for today’s consumer. They are very quiet, virtually maintenance-free and reliable. For doors that are very heavy, the belt can tend to stretch with variability causing jerkiness while opening and closing thus a chain drive would be preferred. The rubber belts are reinforced with steel strands to improve performance and longevity, though time will be the true test for longevity as belt-drives have only been around for less than 10 years. A recent addition to the residential opener market is the Torsion Drive. The torsion drive (aka “Jackshaft”) is attached directly to the spring shaft above and to the side of the garage door and thus is less noticeable and is simply the ultra-quiet choice for opening your garage door. There is no lubrication or maintenance required. The torsion drive is also a preferred option for high-ceiling garages where the customer wants to maximize space utilization. Another important design consideration in the lifting mechanism is the Rail Construction. Premium garage door openers provide a solid one-piece steel rail for durability, safety and longevity. Most vendors provide optional “piece-together” rail packages to allow sales in retail and hardware stores where customers can fit the opener box in their vehicle. While these options are easier to transport and save costs they do tend to bind, are less sturdy and a bit noisier than a solid one-piece design. When purchasing a piece-together rail system opener, be sure to know the length of rail that you will need for your door as anything over 7’ will require purchase of an extension kit. The growing trend with advanced garage door openers are Motors powered with DC vs AC. DC motors operate with variable speed for soft start and stop, providing smooth, quiet operation and less wear and tear on your garage door. While they cost more than AC motors today, DC motors consume less energy thus giving the purchaser return on investment in the long run. DC motors also enable the optional use of a battery backup so the opener can continue to function during residential power outages. For most residential garage doors ½ HP should be minimally sufficient. Openers with 1/3 HP should only be used with smaller single-car non-insulated steel/fiberglass garage doors. Increases in HP should be considered for heavy doors, high-usage doors and in cases where there is a ‘need for speed’. A properly balanced door should only require 5-10 lbs of lift capacity regardless of its construction and size. Added HP helps with variability while lifting/closing and in less than ideal door flow conditions (rollers, binding, springs, etc). **Note that DC motors are not rated in HP. HP for DC motors are used for comparison purposes. Today’s garage door openers come with many features and optional accessories. Most brands have the same functionality with some variances to consider when choosing an opener for your home or office. Lighting options include varying wattage support, built-in LED lighting, and motion detection. 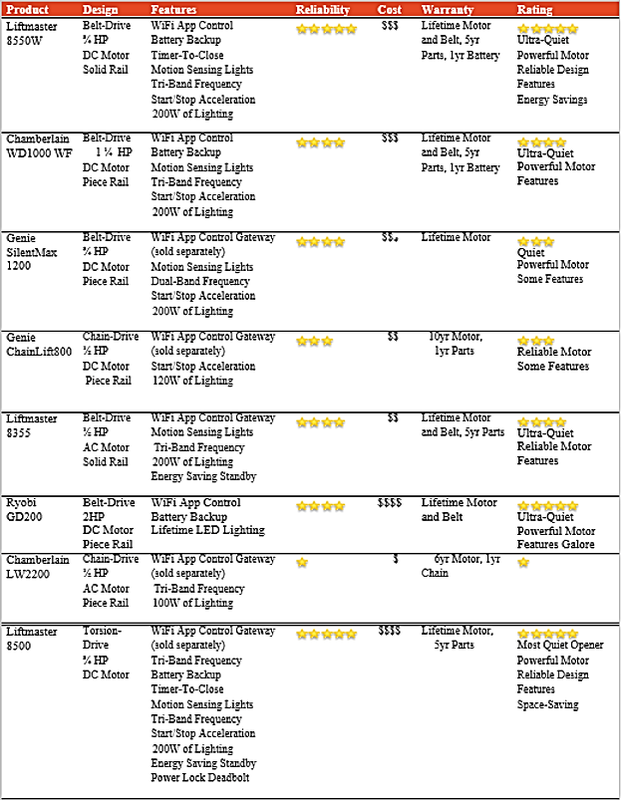 Look at the product specifications to make sure you get the desired lighting for you garage. Remote Control of the opener can be performed via wireless keypads, portable car remotes, through the Homelink® system, or via a Smartphone App. Look for variances in range of remote control as this can vary from 100’ to 300’. Some brands also support multiple radio band frequencies for remote control. In many neighborhoods there exists frequency interference which can reduce the effective range of remote control for your opener. A product with multiple frequency choices helps alleviate this restriction. For Openers with Smartphone App control, ease of internet connectivity should be considered. Some models have WiFi integrated inside the unit while others require purchase of a separate gateway box to enable the feature. All major opener vendors provide modern Safety & Security features including rolling-code encryption, infrared sensors, and resistance back-off. These features ensure your opener cannot be opened by unauthorized users and that persons and property won’t be harmed with a closing door. A plethora of Optional Accessories are also available from the differing brands including Smart Wall Console, Laser Parking Assist, Universal Controls Interoperability, Bluetooth Speakers, etc. As with many home projects, product literature claiming “easy-to-install” usually does not turn out to be the case. When considering your time, required tools, additional hardware, and risks associated with installing an opener without training and experience the logical choice tends towards hiring a professional. Additionally, a reputable Overhead Door company will honor product warranties with installation. If you found this information useful please Like or Share with others. Call Reliant Overhead for your garage door repairs, garage door opener needs, and new garage door sales and installation. We are a customer-focused, professional, advanced trained team of experts locally owned and operated in the North Texas Area. We use only the highest quality parts in the industry and provide reliable warranties without outrageous hidden fees. Our service technicians are trained, mature, and clean-cut and are dedicated to customer satisfaction.